Here I am with yet another marbled recipe for you today! I’m on a mad tear! 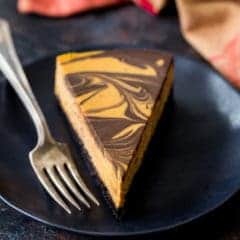 In the last week or so, we’ve talked about Cheesecake Swirl Brownies and Marble Cake, and now here I am with this gorgeous Pumpkin Chocolate Swirl Cheesecake. What can I say, I just love swirling things I guess! Have you ever tried pumpkin and chocolate together? I have to admit, when I first started seeing the combination I thought it sounded totally gross. I just couldn’t imagine how cinnamon and ginger could possibly work with chocolate. Then I finally caved and made this Pumpkin Chocolate Halloween Cake, and oh my goodness. I saw the error of my ways. Pumpkin and chocolate belong together. They are a match made in heaven! Try it and you’ll see! This recipe was adapted from my favorite Vanilla Bean Cheesecake. I love it because it is so incredibly creamy, and it never cracks in the oven! But for this pumpkin chocolate cheesecake, we are going to start with a crunchy chocolate cookie crust. Just grind up your Oreos and toss them with a little melted butter, then press the mixture into the bottom of the pan. Next, whip up the cheesecake filling. Start with the cream cheese, sugar, and cornstarch, mixing just until it’s smooth. There’s no need to whip the batter at any point, that will just incorporate air and cause cracking. Just go slow and make sure everything is nice and smooth. For a lump-free cheesecake, add the eggs one at a time. And if you don’t have a silicone edge beater attachment, it’s also a good idea to scrape the bottom and sides of your bowl with a spatula after each egg goes in. This way, your cheesecake batter will be incredibly silky and smooth! An additional egg yolk, a bit of cream, and a dash of vanilla are the final ingredients to this cheesecake base. Now comes the fun part: stir cocoa powder and water together until a paste forms, and add about half the cheesecake batter to this mixture. Then, to the other half, add your pumpkin puree, cinnamon, ginger, and cloves. Transfer the two different batters to the prepared pan, and swirl! I just love the contrast of colors: dark, almost black cocoa and vivid orange pumpkin. It’s so Halloween-y! WHAT KIND OF PAN SHOULD THIS PUMPKIN CHOCOLATE CHEESECAKE BE BAKED IN? In every other cheesecake recipe on this site, I talk about my dislike for the springform pan. I have been a huge proponent of baking cheesecakes in regular cake pans. You see, I like to bake cheesecakes in a water bath, and in my experience, springform pans always, always leak. Even when wrapped in foil! So I have found that a regular cake pan is best. When the cheesecake has been properly chilled, it’s firm enough to flip out easily onto the serving plate. But in this case, I thought it would be best to use a 9-inch springform, just because this recipe calls for quite a bit of pumpkin puree, and I was afraid that it wouldn’t all fit into my favorite 8-inch diameter cake pan. Can you guess what happened? Yep! It leaked. Even though I had it wrapped in foil (as you can see in the video below). But you know what? It still tasted amazing. So the moral of the story is, if you have a 9-inch diameter by 3-inch high cake pan, use that! If not, a 9-inch springform pan will suffice. And now off I go to order a 9×3″ round cake pan. CAN THIS MARBLED PUMPKIN CHOCOLATE CHEESECAKE BE MADE AHEAD? That is definitely what I would recommend! Cheesecake bakes low and slow, so it takes a loooong time to bake and an even longer time to cool. 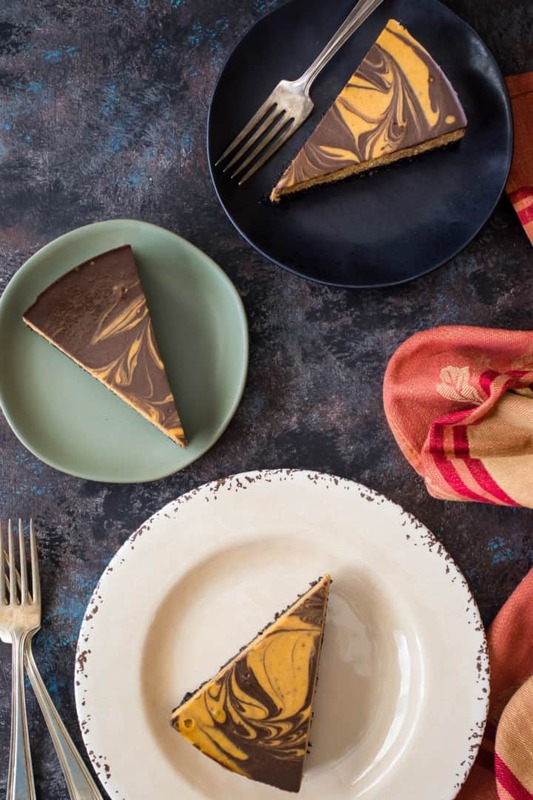 So I would recommend baking this pumpkin chocolate swirl cheesecake at least a day ahead of when you’d like to serve it, so it has plenty of time to firm up in the fridge. HOW LONG WILL THIS CHOCOLATE PUMPKIN CHEESECAKE KEEP? This cheesecake will be fine at room temperature for at least 24 hours, in the fridge for several days, or in the freezer for several weeks to a month or two. If you decide to freeze it, just allow it to thaw in the fridge. It becomes silky-soft at room temperature, so if you like it a little more dense and thick (like a New York style cheesecake), serve it cold. 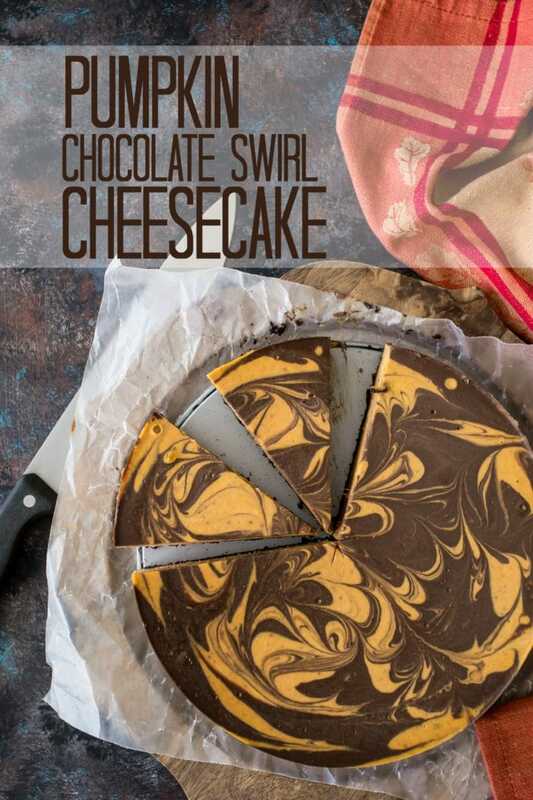 Either way I think you’re really going to love this pumpkin chocolate swirl cheesecake! The earthy pumpkin, warm spice, and rich chocolate flavors are such an incredible combination, and the smooth, rich, and creamy filling is so good with the crunchy cookie crust! It’s a perfect dessert for any fall get-together! 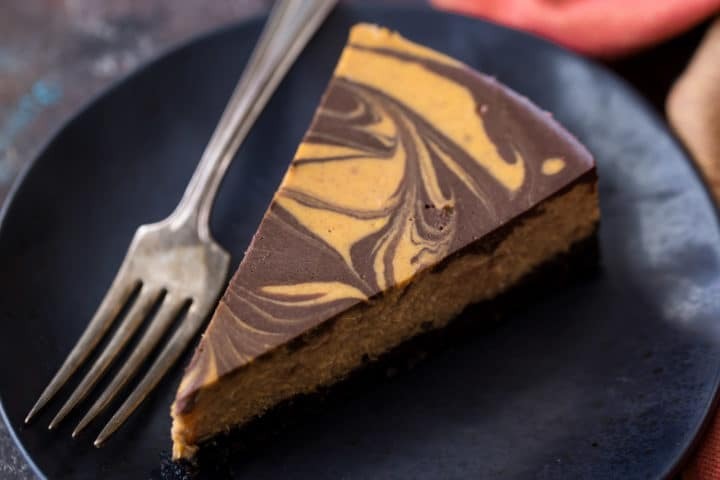 Pumpkin Chocolate Swirl Cheesecake: so perfect for this time of year! You'll love the earthy pumpkin, warm spice, and rich chocolate flavors. Pulse the cookies in a food processor until finely ground. Add the melted butter, and continue to pulse until combined. Transfer the mixture to a greased 9-inch diameter springform pan**, pressing it into an even layer at the base of the pan. In a large mixing bowl, combine the cream cheese, sugar, and cornstarch, mixing on medium speed until smooth. Add the eggs, one at a time, stopping to scrape the sides and bottom of the bowl with a silicone spatula after each addition. Mix in the egg yolk, cream, and vanilla. Whisk the cocoa powder and water together in a medium bowl, and add about half the cheesecake batter to the mixture, stirring until blended. Add the pumpkin, cinnamon, ginger, and cloves to the remaining cheesecake batter, and pour over the prepared crust. Drop dollops of the chocolate cheesecake batter over the top and swirl together with a toothpick. Place the cheesecake pan into a larger baking dish, and pour water into the larger baking dish until it comes about 1 1/2 inches up the sides of the cheesecake pan. Bake the cheesecake for 20 minutes at 350 degrees F, then turn the oven temperature down to 250 degrees F and continue to bake for about 80 minutes more, or until the cheesecake is set around the edges but still a little wobbly towards the center. Turn the oven off, open the door slightly, and allow the cheesecake to come to room temperature. Chill the cheesecake for at least 2 hours before slicing. *I used a 50/50 mix of regular unsweetened cocoa powder and dark (Dutch processed) cocoa. **A 9x3-inch round cake pan, greased and lined with a circle cut from parchment, can also be used. I love pumpkin cheesecake, but with a swirl of chocolate has now trumped the plain version! So yummy! I remember the first time someone suggested that I try a pumpkin and chocolate mix. I thought they were crazy, but boy was I wrong- what a delicious combination! This recipe is fantastic! I would really like to make miniature versions of this for a bake sale using a standard muffin tin. How would you recommend I adjust the baking time/temperature? Hey Phebe! So glad you’re going to give this recipe a try. Bake the cheesecakes at 275 degrees F. You won’t be able to do a water bath with a muffin tin. Check the mini cheesecakes after about 24 minutes. You’ll know they’re done when they’re set around the edges and just a little wobbly towards the center. Good luck! Perfect for the fall holidays! How much water gets mixed in with cocoa?